Big Sky Resort is the premiere downhill skiing destination in Montana. 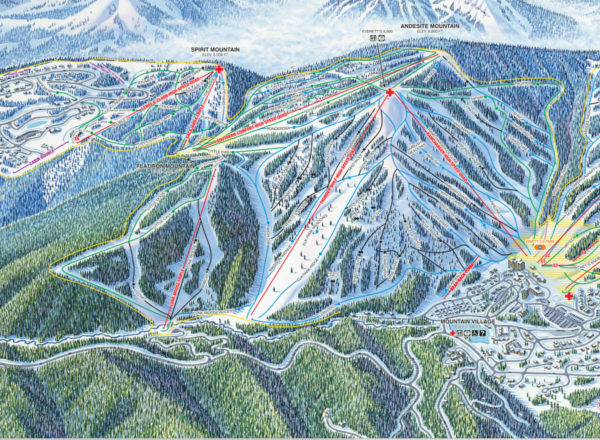 Operating under the moniker “THE BIGGEST SKIING IN AMERICA”, Big Sky Resort is big(5,800 acres), with four different mountains connected by chair lifts, runs that are 6 miles long, and the Loan Peak Tram that takes skiiers to the summit of Lone Mountain (11,166 feet). The ski area itself sits among the Spanish Peaks, which contain some of the highest peaks in Montana. The Spanish Peaks also boast some of the highest vertical rises in Montana when measured from valley floor to mountain peak. Big Sky’s location also provides another benefit—the ski area receives substantial snow during a normal year(Learn more about Big Sky, MT Climate). Located at 45°15′0″N and at a base elevation (Mountain Village) of over 7,500 feet, the an average annual snowfall is over four hundred inches. Big Sky receives more snow than any ski area in Montana, and Big Sky’s higher altitude and more northerly latitude result in better snow preservation than most ski areas. Big Sky Resort opened in late 1973. In October 2013, Big Sky Resort became the largest ski resort in the United States by land area with 5,800 acres (2,300 ha) and a vertical drop of 4,350 ft (1,326 m). 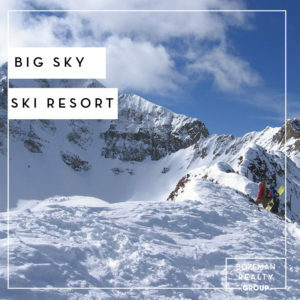 In July 2013, Big Sky Resort acquired 200 acres on Spirit Mountain, previously a private ski mountain for Spanish Peaks members, which is accessible by chairlift. In October 2013, Big Sky Resort acquired the terrain and facilities of Moonlight Basin, a neighboring resort that shared the northern exposure of Lone Mountain. Big Sky resort is a true “destination ski area”, a place where you come to not only ski during the day but to also spend the night as well. Additionally, as a destination ski resort, Big Sky caters primarily to the out of state skier. Everything a traveling skier could ever need is located in Big Sky, from a fairly vibrant nightlife, luxurious hotels, ample shopping opportunities and gourmet dining. The skiing at Big Sky can be divided into three areas. These different areas are Lone Peak, Andesite Mountain, and the Moonlight Basin area. The widest variety and most challenging skiing at Big Sky Resort is located in the Lone Peak area. The Lone Peak area consists of all the ski runs that are on Lone Peak. Tree line at Big Sky is around 9,000 feet, with the top of Lone Peak well above Tree Line. 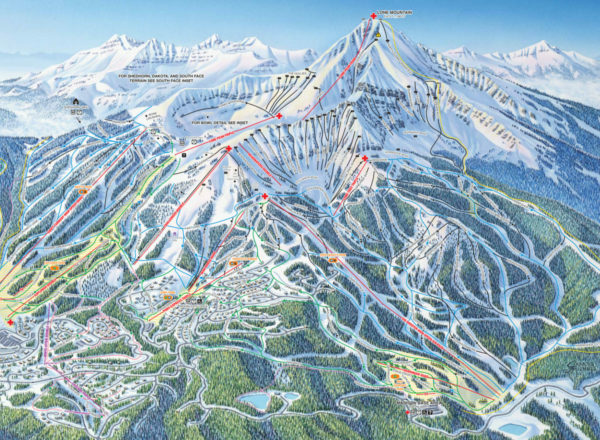 The ski runs on Lone Peak contain everything from well groomed intermediate runs, nice and flat beginner runs, and advanced expert ski runs that drop down steep, narrow chutes. The most challenging runs on Lone Peak are accessed from the summit of Lone Peak. Reaching the summit of Lone Peak is only accessible from the Lone Peak Tram. By design, the tram has a low capacity so as to prevent overcrowding on the small summit of Lone Peak. Lift lines at the Tram can be long. Located to the east of Lone Peak and rising sharply out of the Mountain Village Base Area to a summit elevation of 8,800 feet is Andesite Mountain. The Mountain Village side of Andesite Mountain is served by the Ram Charger Express High Speed Quad. The ski runs on Andesite are some of the nicest groomed intermediate ski runs at Big Sky Resort. The back side of Andesite Mountain(east side) are the ski runs that are viewable from the road leading to the Mountain Village. The back side of Andesite Mountain contains a mix of expert and intermediate trails, with a vertical rise measuring 1,728 feet. The side of Andesite Mountain is served by the Thunder Wolf Express High Speed Quad. In comparison to other areas at Big Sky, the back side of Andesite Mountain is lightly used and is thus a good place to go to escape the crowds when the resort is busy. Andesite Mountain actually has two backsides, one of which is designed more for beginners. This “second” backside on Andesite Mountain has perfect beginner terrain, with gentle slopes and wide runs that lead down to the Sacajawea Triple lift and Lewis & Clark High Speed Quad on the Spirit Mountain area of Big Sky. The vertical rise on the back side of Andesite Mountain measures 1256 feet. For beginner skiers looking for some nice terrain well away from the crowds found around the base area, this is the place to come. 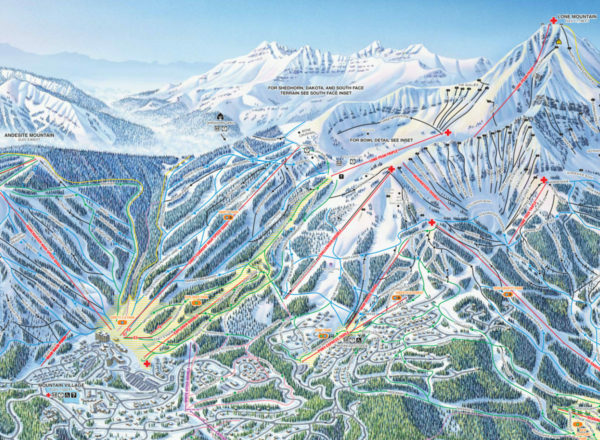 In October 2013, Moonlight Basin ski resort became part of Big Sky Resort. This acquisition added more than 1500 acres of new skiing at Big Sky. The Moonlight Basin area is primarily north facing. The northerly exposure frequently results in packed powder conditions well into spring. The Moonlight Basin area is less skied than the other parts of the mountain. Excellent trail variety abounds, with advanced expert skiing found at the Headwaters. Moonlight Basin also has gentle lower mountain topography with many groomed trails that have been cut narrower. Numerous intermediate trails meander their way through the forested slopes of the lower mountain. Beginner terrain in the Moonlight Basin section contains some of the nicest trails at Big Sky. The primary lift at Moonlight Basin is the Six Shooter, a high speed six pack chairlift that climbs 1850 vertical feet from the base and is nicknamed “the flying couch.” The Headwaters chairlift connects at the top of Six Shooter, rising another 685 feet, for a total lift-served vertical rise of 2535 feet from the 7000 foot base. The other upper lift is the Lone Tree quad, installed in 2004 for the second season, which allows access to the glade like terrain northwest of the Headwaters.